This guide is created to be a helpful resource in the process of researching the decline of the samurai class during the late Tokugawa shogunate. Before the beginning of the Meiji Restoration in 1868, samurai were an integral part of Japanese lifestyle and culture. For centuries, many had prominent roles in political and military realms and instilled Confucianistic values in Japanese society. However, with the decline of the Tokugawa regime, social, political, military, and economic aspects of domestic Japan began to change–ushering in the Meiji Restoration. The “modern” Meiji period no longer sought the seemingly “traditional” samurai and their swords, and so began a new era of Japanese history. This guide consists of seven sections of valuable resources, which includes mediums in the form of books, journal articles, websites, databases, archives, directories, libraries, and museums. It starts with a general historical overview of Japanese history, before the Meiji period, and background on the samurai class. 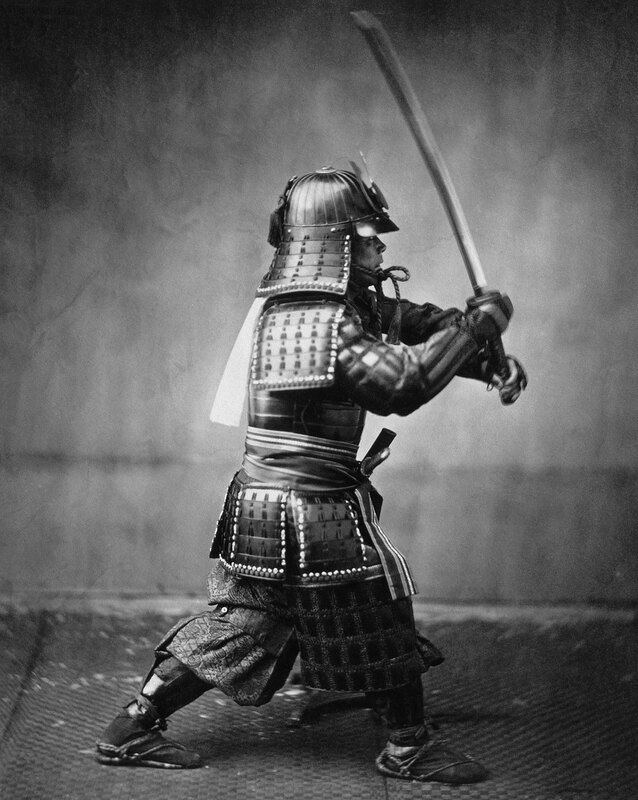 The second section–Samurai Life–is divided into sub-sections of societal (bushido and duty), military, and political aspects of samurai culture. The next three sections include historical time frames: late Tokugawa period, early Meiji period, and transition from Tokugawa to Meiji period. The sixth section includes information about influential samurai in Japanese history and related books. Lastly, the final section includes related resources that may be of additional help for researching this topic, including resources to databases, archives, directories, guides, libraries, and museums. It is beneficial to begin background research on this topic with a work by Karl Friday, as he is a highly respected expert in classical and medieval Japanese history and also serves as a Professor at The University of Georgia. This volume of writings from leading authorities, which Friday compiles, serves as a sufficient introductory resource into Japanese history. It explores the main developments of the Japanese lifestyle, without being too concerned with names and dates, and depicts the evolution of Japanese political, social, economic, and intellectual life. Friday, Karl. Japan Emerging: Premodern History to 1850. Boulder: Westview Press, 2012. In addition to Karl Friday, Stephen Turnbull is another noteworthy historian to reference. Turnbull is considered one of the world’s leading experts in Japanese samurai history, especially military history, and has prolifically written a number of books on samurai culture. Samurai: The World of the Warrior serves as a corrective to popular pre-conceived notions about samurai as it presents an all-encompassing view on warrior culture. Utilizing themed chapters, Turnbull analyzes the samurai through their historical development and their relationship to the world around them, in addition to their more violent, warrior-like tendencies. Turnbull, Stephen. Samurai: The World of the Warrior. Oxford: Osprey Publishing Ltd., 2003. Samurai: The Code of the Warrior does an excellent job of summarizing every aspect of the samurai culture. Topics range from the daily life of samurai, to their military strategies, to their resolute Bushido philosophy. In the first chapter, it also succinctly addresses the rise and fall of the samurai. Ito, Tommy, and Thomas Louis. Samurai: The Code of the Warrior. New York: Sterling Publishing Co., Inc., 2006. The information on this online resource is not lengthy, but the “Samurai Dates of Importance” and “Samurai Terms” sections are helpful to simply gain a general understanding of the timeline of samurai history and to become knowledgeable about important Japanese terms. McGee, Mark. “Brief History of the Samurai.” University of Michigan. Similar to the above University of Michigan resource, this online resource offers an extremely brief overview of samurai origins and philosophy. Additionally helpful is the provided timeline, which spans from ancient to modern samurai history. Deguzman, Joseph, Josh Hascall, and Joel Martinez. “Age of the Samurai.” San Jose State University. Written by eighteenth-century samurai Yamamoto and later compiled by Tashirō, this book fundamentally serves as the practical and spiritual guide for the samurai. It outlines the expectancies of bushido, the warrior code, and addresses the fierce loyalty that is necessary to serve a samurai lord–even if it means being prepared to die at any moment. Yamamoto, Tsunetomo. Hagakure: The Book of the Samurai. Edited by William Scott Wilson. Boston: Shambhala Publications, Inc., 2002. After writing his death poem, a samurai is illustrated preparing to commit seppuku (ritual suicide) after losing a battle for his master. In addition to Hagakure, this book serves as a classic text on the way of the samurai. Translated into English in 1900, this text was read by prominent foreign leaders such as Theodore Roosevelt and John F. Kennedy. Nitobe, Inazo. Bushido: The Soul of Japan. Japan: Kodansha International Ltd., 2002. This book serves as an English translation to Yamaga’s Sokō’s seventeenth-century work. Heavily influenced by Confucian teachings, Yamaga was one of the most influential leaders in the development of bushido. He believed that a samurai’s devotion to duty and moral leadership was most important. Yamaga addresses the necessary combination of martial training (bu) with high intellectual pursuits (bun) to create a well-rounded samurai. Yamaga, Sokō. The Way of the Samurai, in Sources of Japanese Traidion, Volume I. New York: Columbia University Press, 1958. Eiko’s book expresses how the samurai’s unique sense of honor and tension between competition and collaboration have ushered Japan’s own form of modernity–dissimilar to the Western route. Eiko uses sociological, anthropological, and historical approaches to support her argument. Eiko, Ikegami. The Taming of the Samurai: Honorific Individualism and the Making of Modern Japan. USA: President and Fellows of Harvard College, 1995. In this book, Friday aims to examine several aspects of samurai warfare: the principles that justified armed conflict, the mechanisms of armed forces, the weapons of early medieval warriors, and the techniques and customs of battle. Most significantly, this study highlights the intertwined relationships between early medieval political power, technology, and war. Friday, Karl. Samurai, Warfare and the State in Early Medieval Japan. New York: Routledge, 2004. Friday’s book provides insight as to how the samurai warrior class was spontaneously generated in Japan. It explains the momentous shift from police and military protection to the privatization of protection by professional mercenaries of the provincial elite. Friday, Karl. Hired Swords: The Rise of Private Warrior Power in Early Japan. USA: Stanford University Press, 1992. This book has become a common source of reference for samurai life and warfare. It tracks the development of the Japanese warrior class and their exceptional skill as warriors, which culminates in the epic Battle at Osaka Castle. Turnbull, Stephen. The Samurai: A Military History. London: Osprey Publishing Ltd., 1977. Drea expresses how the samurai culture was instrumental in creating the contemporary image of Japan’s imperial army. Its intellectual foundations in samurai thought directed the social changes necessary to catapult Japan’s military to a global force. 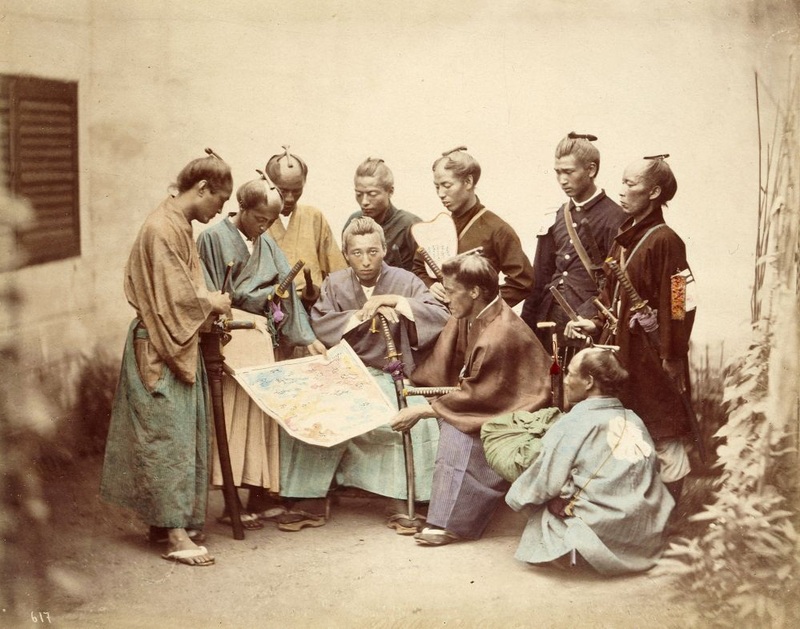 Drea explains how samurai thought affected strategies and aims of Japanese military, and highlights philosophies of prominent military leaders who believed in a “fight to the death” attitude as a result of embedded samurai mentality. Drea, Edward. Japan’s Imperial Army : Its Rise and Fall, 1853-1945. Kansas: University Press of Kansas, 2009. A bakufu refers to the tent government that was ruled by a shogun in Japan through the Tokugawa period. Mass and Hauser’s book analyzes this form of government that ruled Japan for almost 700 years, and addresses the samurai’s role within the shogunate. Jansen explains how the majority of Japan’s political history was shaped by competing ambitions of fighting men. He traces the institutional development of warrior rule and dominance in Japanese history and expresses that warrior values have still influenced modern Japanese ethical codes. This particular volume is a compilation of chapters taken from Volumes Three and Four from The Cambridge History of Japan. Jansen, Marius. Warrior Rule in Japan. USA: Cambridge University Press, 1995. Beasley’s article argues that efforts for the Japanese daimyo to not fully support the Tokugawa shogunate affected the political structure in Japanese government during the succeeding Meiji period. Beasley also explains that the study of domain politics is essential in understanding the Meiji Restoration. Beasley, W.G. “Politics and the Samurai Class Structure in Satsuma, 1858-1868.” Modern Asian Studies 1, no. 1 (1967): 47-57. 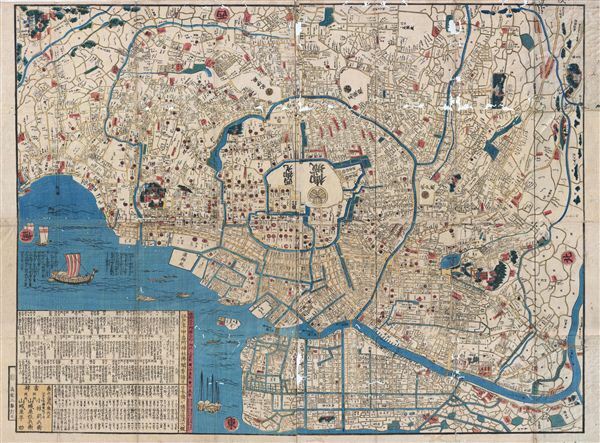 A map of Japanese homes encircling Edo castle to illustrate Tokugawa hegemony and space. This section of the research guide aims to encompass the mainly social characterization during Japan’s late Tokugawa shogunate. The late Tokugawa period in Japan is often identified by much social and cultural tension amongst samurai and other classes, due to conflicting traditionalist and modernist ideals of the time. The transition into the Meiji period, which is accepted as the beginning of Japan’s modern state, was a direct cause of the national and international tensions and influences of the late Tokugawa period. The following sources serve to illustrate the respective environment of this period. Ray A. Moore’s article “Samurai Discontent and Social Mobility in the Late Tokugawa Period” aims to provide evidence for reasons why the samurai class increasingly grew with discontent politically, socially, and economically with the Tokugawa shogunate. Appraising Genji analyzes, in the form of literary criticism, one of Japan’s richest fictional tales to explore the cultural confusion of Japan’s niche in the world during the Tokugawa period. Musui’s Story expresses an honest view of a Tokugawa samurai as it tracks the life of samurai Katsu Kokichi and his inner struggles with loyalty and kindness, greed and deception, vanity and superstition. Moore, Ray. “Samurai Discontent and Social Mobility in the Late Tokugawa Period.” Monumenta Nipponica 24, no. 1/2 (1969): 79-91. Caddeau, Patrick. Appraising Genji: Literary Criticism And Cultural Anxiety in the Age of the Last Samurai. USA: State University of New York, 2006. Craig, Teruko. Musui’s Story : The Autobiography of a Tokugawa Samurai. USA: The University of Arizona Press, 1988. The following sources in this section aim to express the environment in Japan during the early Meiji period. Often referred to the period during which Japan became “modernized,” leaders of the Meiji Restoration strived to satisfy their nation’s discontent that were caused by much social, cultural, political, and economic discontent. The early Meiji period was characterized by new changes in legislature, a further introduction of Western ideals, and the increasing obsoleteness of traditional samurai values. The following sources aim to provide a depiction of this period’s atmosphere. The Charter Oath, also known as the Oath in Five Articles, was issued on April 7, 1868. Only consisting of five short clauses, it outlines the goals of Japanese modernization during Meiji rule–often considered the first constitution of “modern” Japan. Concerning samurai, it was most significant as it began the legal dismantling of the entire samurai class. The Self-made Man in Meiji Japanese thought suggests that the work ethic, team effort, and social utility found in working-class men during the Meiji period were direct results from the ideals and philosophies of samurai of the previous era. “The Progress of Japan and the Samurai Class, 1868-1882” expresses that the samurai class was completely instrumental in ushering in the Meiji Restoration–that there is an evident relationship between the class and the establishment of the Meiji state. Only five clauses long, the Charter Oath marked the legal beginning of Japan's road to modernization. “The Charter Oath (of the Meiji Restoration), 1868.” Columbia University Asia for Educators. Kinmonth, Earl. The Self-made Man in Meiji Japanese Thought : From Samurai to Salary Man. USA: University of Wisconsin, 1974. Harootunian, Harry. “The Progress of Japan and the Samurai Class, 1868-1882.” Pacific Historical Review 28, no. 3 (1959): 255-266. doi: 10.2307/3636470. As expressed in the previous two sections on the respective Tokugawa and Meiji periods, the transition from the Tokugawa shogunate to the new Meiji leadership resulted in inevitable change. The effects of this transition resulted in shifts in the samurai class and a re-considering of samurai duties and loyalties to the Emperor. The transition from the Tokugawa to Meiji period is easily considered a monumental stage in Japanese history as it affected social discontent, political leadership, economic hardship, cultural re-configurings. Emperor Meiji ruled over Japan as it transitioned from being a feudal shogunate to a world power. The following sources aim to provide helpful research about this transition period. Japan in Transition explores what kind and what degree of change accompanied the political events from the Tokugawa to Meiji leadership. This book also includes quantitative data to add support to its claims. The Making of Modern Japan offers a magnified view of the critical period in Japanese history from 1600 to the present. Specifically, it focuses on the intimate workings of Japanese society. Jansen, Marius. Japan in Transition, From Tokugawa to Meiji. USA: Princeton University Press, 1988. Jansen, Marius. The Making of Modern Japan. USA: Harvard University Press, 2000. Taira Masakado was one of the first samurai leaders in tenth-century Japan and led a rebellion against the Kyoto government. This book focuses on introducing Taira and the role of the early samurai as leaders. Friday, Karl. The First Samurai: The Life and Legend of the Warrior Rebel, Taira Masakado. Hoboken: John Wiley & Sons, Inc., 2008. Saigō Takamori is often given the title of the “last samurai.” Arguably one of the most influential samurai, especially during the fall of the samurai class during the transition into the Meiji period, he led the Satsuma Rebellion in 1877, which marked the last of a series of uprisings against the new Meiji government. The Last Samurai chronicles the fortuitous rise and tragic fall of Saigō. Ravina, Mark. The Last Samurai: The Life and Battles of Saigō Takamori. Hoboken: John Wiley & Sons, Inc., 2004. Sakamoto Ryōma led a movement to overthrow the Tokugawa shogunate at the very end of the period. He was ultimately assassinated in 1867, but his legacy lives on as his image is often romanticized in popular culture. Sakamoto Ryōma and the Meiji Restoration illustrates the type of leader that Sakamoto became, and it tells the story of the Meiji Restoration in light of Sakamoto’s career. Jansen, Marius. Sakamoto Ryōma and the Meiji Restoration. Princeton: Columbia University Press, 1994. Yamoaka Tesshū was a famous samurai of the Bakumatsu period who played a critical role during the Meiji Restoration. The Sword of No-Sword details Yamoaka’s life in the lens of his legendary martial arts skills and his careful handling of military affairs during the delicate period of nineteenth-century Japan. Stevens, John. The Sword of No-Sword: Life of the Master Warrior Tesshū. Boston: Shambhala Publications Inc., 1989. Yamagata Aritomo is often seen as the father of Japanese militarism. Born into a lower-rank samurai family, he eventually became field marshal of the Imperial Japanese Army and Prime Minister of Japan. Hackett’s book serves as a biography of Yamagata and details the processes and strategies of Yamagata’s political and military agendas. Hackett, Roger. Yamagata Aritomo in the Rise of Modern Japan, 1838-1922. USA: Harvard University Press, 1971. This online database contains 787,192 records on all subjects pertaining to East, Southeast, and South Asia published worldwide from 1971 to the present. “Bibliography of Asian Studies.” Association for Asian Studies. 22 March 2011. This directory offers a wide range of external resources, including museums, archives, and bibliographies. The resources are arranged chronologically. “East & Southeast Asia: An Annotated Directory of Internet Resources.” Newton.UOR. 2005. This directory by Columbia University is polished and well-organized. It provides resources mainly targeted towards teachers, and so includes sources such as timelines, document-based questions, lesson plans, and print/video resources, but the directory overall acts as an exceptional introductory guide for beginner learners on Japanese or Asian history. “Asia for Educators.” Columbia University. 2012. This guide offers more current modes of outlets for Japanese exploration such as arts, entertainment, travel, and daily living, but the “Language, Literature & History” section provides a healthy amount of historical resources by chronology and topic. “JGuide.” Leland Stanford Junior University. 2012. Ranked the #1 Asian Studies page by Google in 2011, this virtual library boasts a slew of resources about Asian history and has an impressive online database as well. However, this library stopped publishing operations in January 2011. “Asian Studies WWW Virtual Library.” Australian National University. 25 Jan 2010. This virtual library hosts links to many other useful resources, such as additional guides, atlases, archives, and collections. “Asian History.” University of Washington. 2012. These archives provide access to official documents of the Japanese Cabinet, the Ministry of Foreign Affairs, and the Army and Navy. They showcase original records, including full images of the documents, all in digitized form. “National Archives of Japan.” Japan Center for Asian Historical Records. 2012. These archives collect, organize and display primary historical sources such as letters, diaries, documents, and manuscripts that are related to the political history of modern and contemporary Japan. “Modern Japan in Archives.” National Diet Library. 2010. This museum hosts a research section with digital archives, a library catalogue search, and image search, but these pages are all in Japanese. For non-Japanese speakers, the rest of the museum’s website appears to be in English. “Tokyo National Museum.” Tokyo National Museum. 2012.